Columbine haunts us with sobbing teenagers, grieving parents, and dead students who endure in our collective consciousness. April 20, 1999 wasn’t the first school shooting but it is the one that created a cult of theatrical violence preaching terror and narcissistic loathing. Astonishingly, acolytes embraced the sermon and spread it, wreaking havoc for the next couple of decades, while the rest of us wonder why the nihilistic message appeals to so many. Cullen uses 400 plus pages to illuminate that day and the deranged minds that orchestrated it. After being one of the first reporters on the scene, he spent the following ten years on the book. With a well-paced narrative, he alternates between the years leading up to that day and the fallout that resulted from it. We meet the victims, their families, the killers, their parents, and the overmatched law enforcement officials trying to make sense of it. Poignant moments of strength and forgiveness abound but this is no feel-good book. 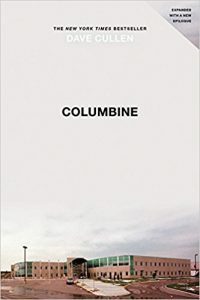 Columbine is most gripping when it explores clinical psychopathy through the twisted mind of Eric Harris along with Dylan Klebold’s sycophantic relationship with him. Harris’s calculating cruelty is so foreign to the empathetic reader, it’s impossible not to be intrigued by his alien thought process. Meanwhile, examining Klebold’s tortured soul gives the reader a different feeling. His relatability lends some humanity to the pair and makes him the more tragic figure. The juxtaposition of the two perpetrators gives the book a dynamic energy that keeps the pages turning and the mind searching for answers. Harris wanted to watch the world burn. Moreover, he wanted to light the match. Klebold was a disillusioned young man whose frustration with a fallen world led to violent outbursts. We watch their relationship develop into a runaway train fueled by animosity, resentfulness, and spite. Cullen frustrates us by illustrating various opportunities local authorities had to derail that hate train. Most gut-wrenching was an affidavit to search Harris’s house that inexplicably slipped through the cracks, despite linking him to a homemade pipe bomb found in the neighborhood. The results were fifteen dead, a nation scarred, and a darker world. Twenty years later, we must admit that Eric Harris won. He got everything he wanted: terror, infamy, a legacy of fans, and copycat killers. He let an evil genie out of the bottle and now he’s laughing in Hell as we blame each other for the destruction. Michigan is the Wolverine State. It’s been our unofficial state motto since our southern neighbors discovered that we were the ugliest, meanest, fiercest creatures of the North. Rather than hide from the insult, we embraced it as a symbol of northern toughness. Curiously though, no living wolverine had ever been documented in Michigan. 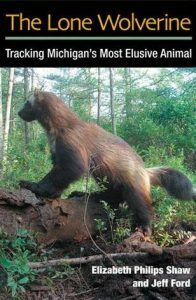 For almost 200 years, we had been the Wolverine State without proof of a wild wolverine ever stepping foot on our soil until one winter day in 2004 in the most unlikely of places. Of course, there had been “sightings” of wolverines in Michigan, along with UFOs, Bigfoot, and Elvis in Kalamazoo. As the first calls of a wolverine sighting came into the DNR office on that cold February morning, the conservation officer took it about that seriously. Eyewitness testimony is slightly better than useless, except when it’s worse. People mistake raccoons for bears, dogs for wolves, and housecats for cougars. It’s easy to imagine the officer patiently rolling his eyes as the first call came in and becoming annoyed as the phone kept ringing but when the call came claiming the wolverine had been treed a few miles south of Bad Axe, it could no longer be ignored. The DNR got there just in time to officially document the first wolverine sighting in the history of the Wolverine State. This mysterious wolverine sighting in Michigan’s Thumb provoked more questions than answers. For Deckerville science teacher and track coach Jeff Ford, the mystery became an obsession. After surviving a family tragedy as a young child, Ford developed an intense bond with the rhythms of the natural world. The solitude and the potential for discovery and connection animated his youth, while allowing his psychological trauma to scar over. He continued to be an avid outdoorsman as an adult, publishing his writings in various outdoor magazines. By 2010, he had earned the title, “The Wolverine Guy” for his work documenting the story of the Michigan Wolverine. How did a wolverine end up in the heart of Thumb, hundreds of miles from the nearest known population? “The Lone Wolverine” tells of Ford’s relentless search for the answer. He pursued it through muck and snow and pushed his ailing heart to the limit. He paid the price for the obsession with time, debt, and familial strain. For six years, he haunted the Minden City Swamp in search of its most famous resident; tracking her, photographing her, collecting DNA samples, and ultimately falling in love with his “pretty gal,” the lone Michigan Wolverine. We’re all richer because of it. Thank you, Mr. Ford. In Hillbilly Elegy, J.D. Vance documents his cultural migration from an impoverished Appalachian Hillbilly in southeastern Ohio to a law student in the hallowed halls of Yale. Having one foot in each of those worlds puts him in a unique position to elegize the cultural ecology from which hillbillies spring. He chronicles poverty and addiction, honor and obligations, and the troubled heart of rural America. 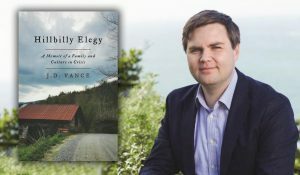 Credited for having his fingers on the pulse of the Trump phenomenon, Vance wrote one of 2017’s most celebrated books. Opioid epidemics, unemployment, broken homes and despair plague shrinking towns and cities of the Rust Belt from Appalachia to the Great Lakes. It wasn’t always this way. For years, the American Dream was within reach for people with little formal education. People migrated from agricultural jobs in the South to industrial jobs in the North and made a proud living. Americans soon took this Post-War industrial boom as our birthright until globalization and automation interrupted our blue collar prosperity. CEOs shipped jobs to Mexico as they discovered Mexicans are also capable of working hard jobs but at a fraction of the wages. Robots work twice as hard and complain half as much. Politicians from Bill Clinton, to Barrack Obama to Donald Trump tell us they can solve our problems. We’ll put tariffs on the countries that are ripping us off. We’ll raise the minimum wage so fast food workers can support their families. We’ll make drugs illegal so people stop doing them… On and on they promise as the Rust Belt gets rustier and health and financial trends that had been on an upward trajectory for centuries are now on the downhill slope of the race to the bottom. Against this narrative backdrop, Vance shines the spotlight on rural culture. How did the culture of people who developed a reputation for hard work become a victimhood culture of learned helplessness? How is it the government’s fault that husbands are leaving their wives and single mothers are smoking meth? How can schools educate kids who subsist on Coke and Pop Tarts? How can people be trained to work if they’re unwilling to clean up their yards, brush their teeth or take care of their own dogs? Unlike the politicians with their promises, Vance doesn’t talk about grand solutions. He doesn’t suggest an easy trade war to solve the problems or more government spending. It’s not about Left versus Right. It’s not a self-help book either. There are no step by step solutions to getting us out of poverty but getting our own houses in order is a fine place to start. Original music and diverse covers that focus on compelling lyrics and rich, warm melodies. Described by the Detroit Metro Times as a “songwriting prodigy” and one of their top 15 artists to watch in 2016. Emma released her second album “Roots” on Backburner Records in 2017. Create your own splatter paint art. Josh Sawdon will amaze with his power of suggestion. Using volunteers from the audience, Josh will work his magic to create laughs for everyone. Enjoy songs by Hank Williams, the Everly Brothers, Buddy Holly and more!